Misty born 1975 - Travels with husband on his jobs. Started school in Marshall in the 7th grade, I was just an average student, really not well known, except for carrying radios to school and riding a tall bicycle to school and parking it behind Mrs. simmons place where we ate lunch(we could go off campus then). Mr. Grantham(history teacher) would take some of us boys to the old Bishop College gym on Saturdays to play basketball. After High School, joined the army(when I got a draft notice!!!) and put in signal corp after basic training. Went to Vietnam May'68, came back to Marshall on leave and went back for eight more months(what was I thinking??). Spent the last 10 months at Ft. Hood and discharged in Oct'70. 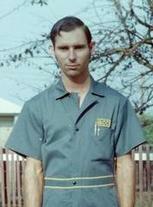 Worked at a bicycle/lawnmower shop until I turned 25 and then got a driving/courier job with Purolator courier for 3 years, Then went to work(1975) for Mar-Tex Glass and now with Harrison county Glass Company. Donald Carter posted a message. Donald Carter added a comment on his Profile. Donald Carter posted a message. New comment added. Donald Carter added a comment on Scotty Furrh's Profile. We really don't dress like this all the time. This was a church special day.